This is what happens when just a few great ingredients come together and party on your plate! Chop 1 roma tomato and one small zucchini, then sautee a few minutes, unti the zucchini is temder, add some minced garlic to taste, some Italian seasoning to taste dash of salt, and a drizzle of Rana’s Pesto Genovese. Cook desired amount of pasta until AL dente. I boiled 1 cup’s worth. Top with fragrant vegetable mixture of your choice….mushrooms or zucchini tomato garlic. 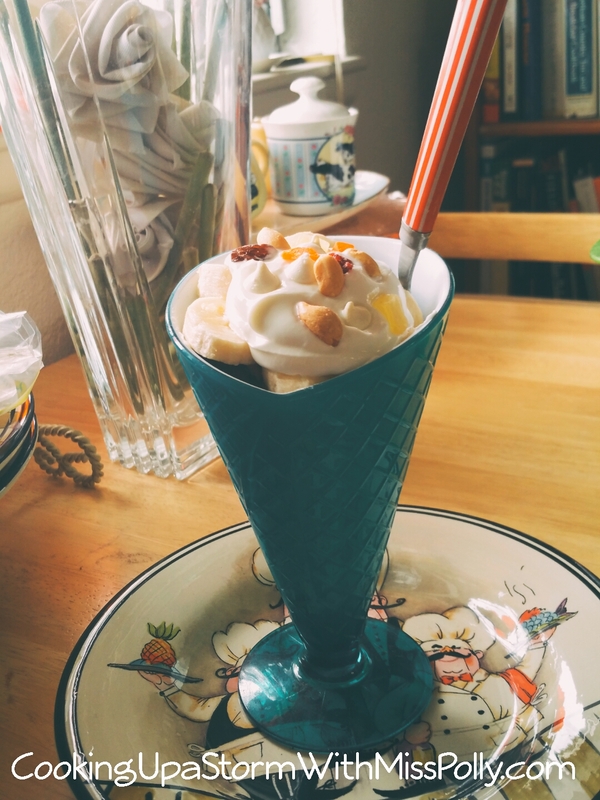 Simply just take a parfait glass and take your favorite trail mix, either with fruit or nuts, and put some in the bottom of the glass. 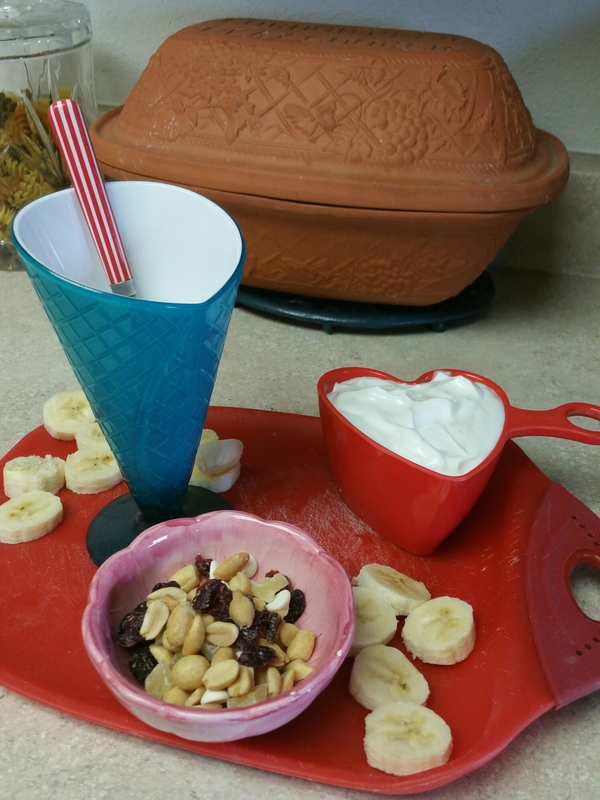 Then add some sliced bananas then put some Greek yogurt on top of that, then some more trail mix, and bananas and then Greek yogurt. 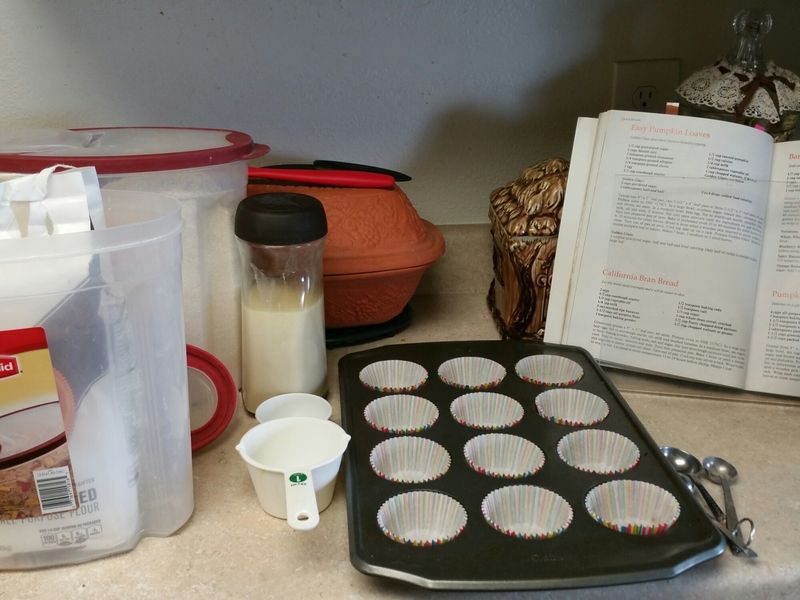 I used 1 cup of Walmart brand Greek yogurt, and I measured it out. one sliced banana and three tablespoons of a trail mix. 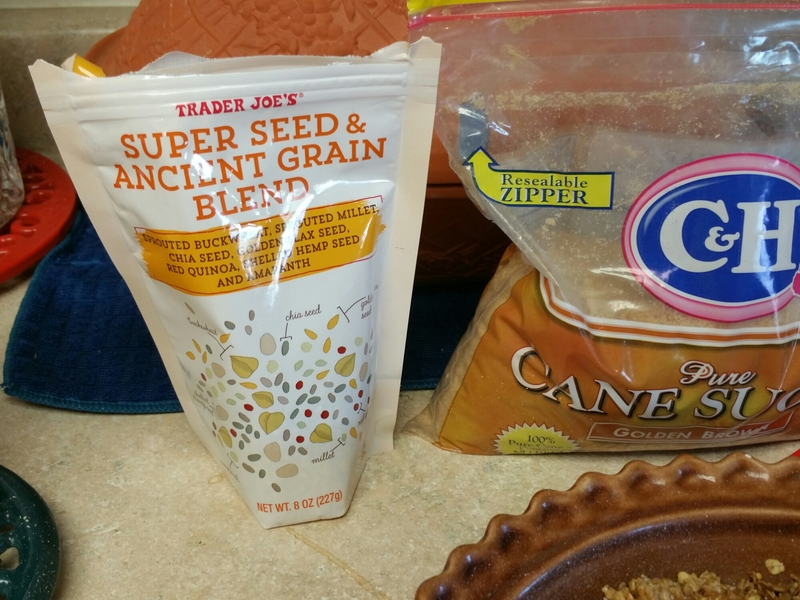 I used 3 tablespoons of Nature’s Harvest trail mix. 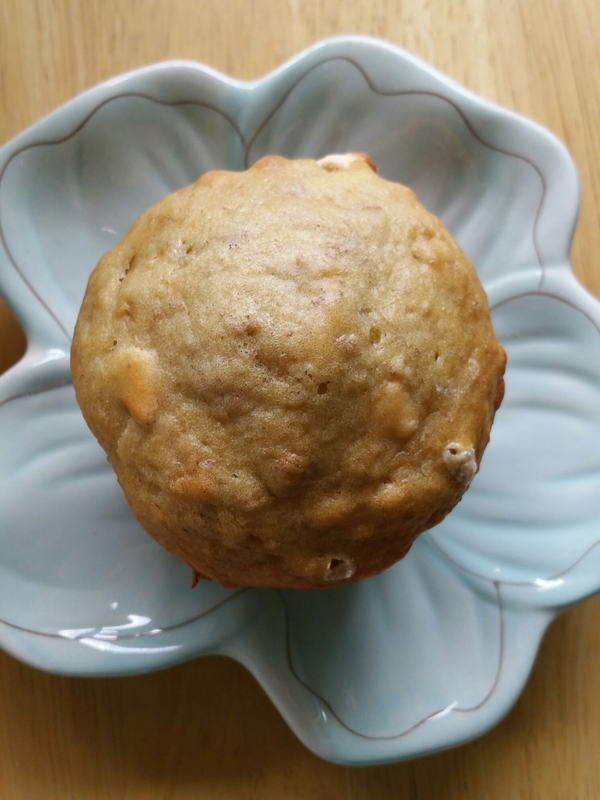 It has a blend of peanuts, dried cranberries, white confectioner’s drops, dried pineapple, dried papaya, and raisins. You can use anything you want though. 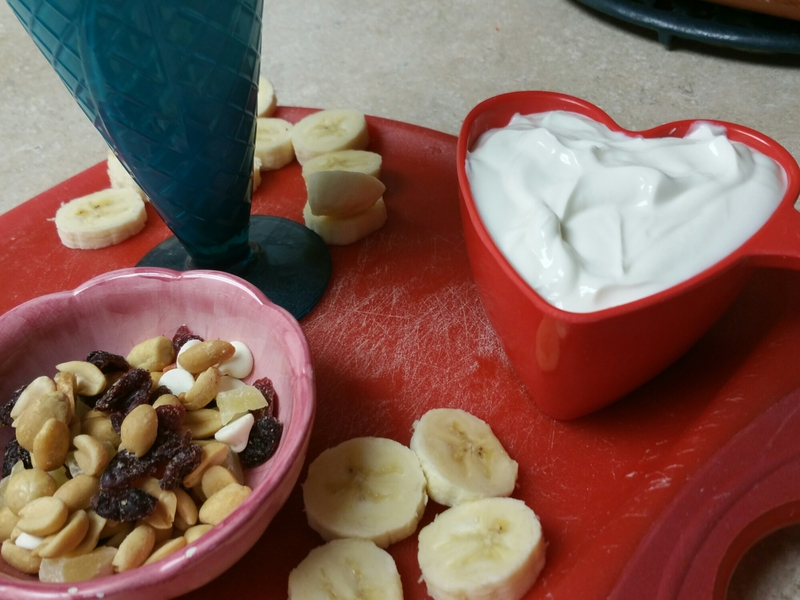 1 cup Walmart Greek Yogurt….one of the best tasting I ever had. 8 grams fat, 310 milligrams potassium, in that one cup of Greek yogurt. Plus it’s just awesome tasting and really good for you! The one the only ingredient that are in it is cultured pasteurized Grade A milk. Great Value brand. 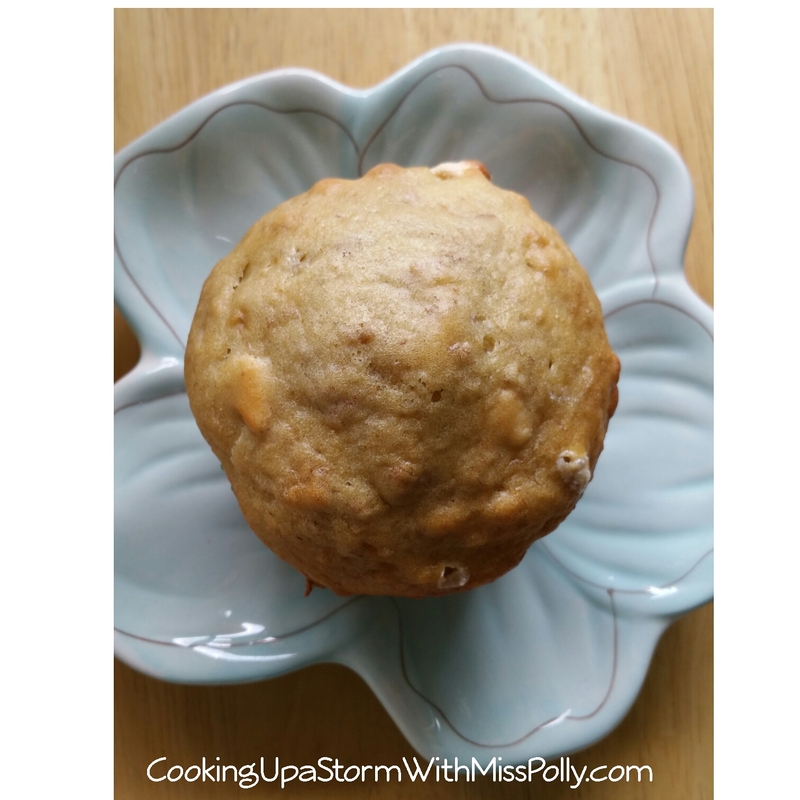 It tastes kind of like creme fraiche and has a super fresh flavor with honey or on its own. 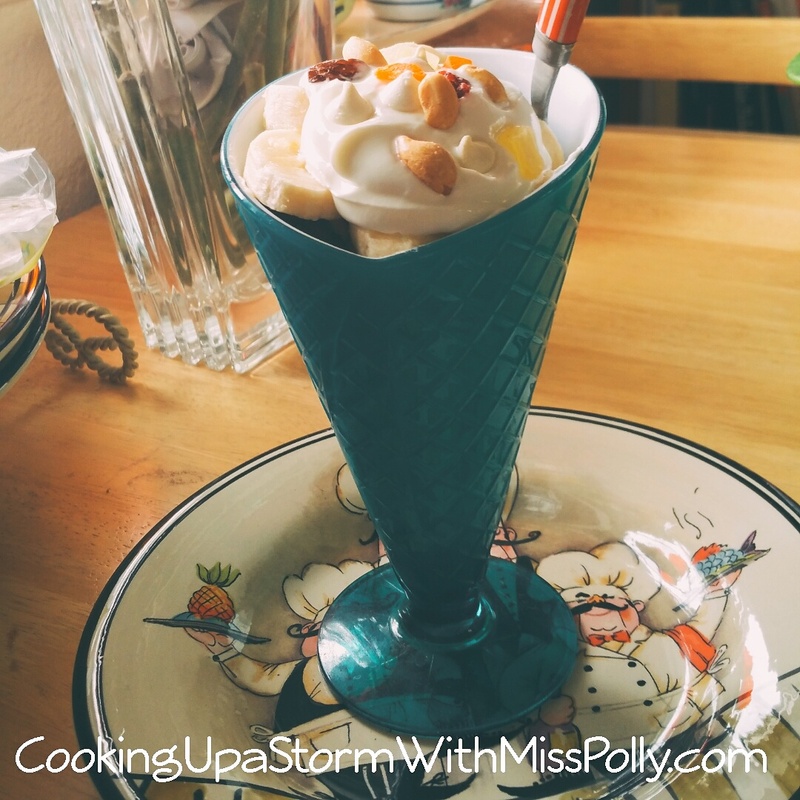 Polly’sPicks rate it as great as Trader Joe’s. 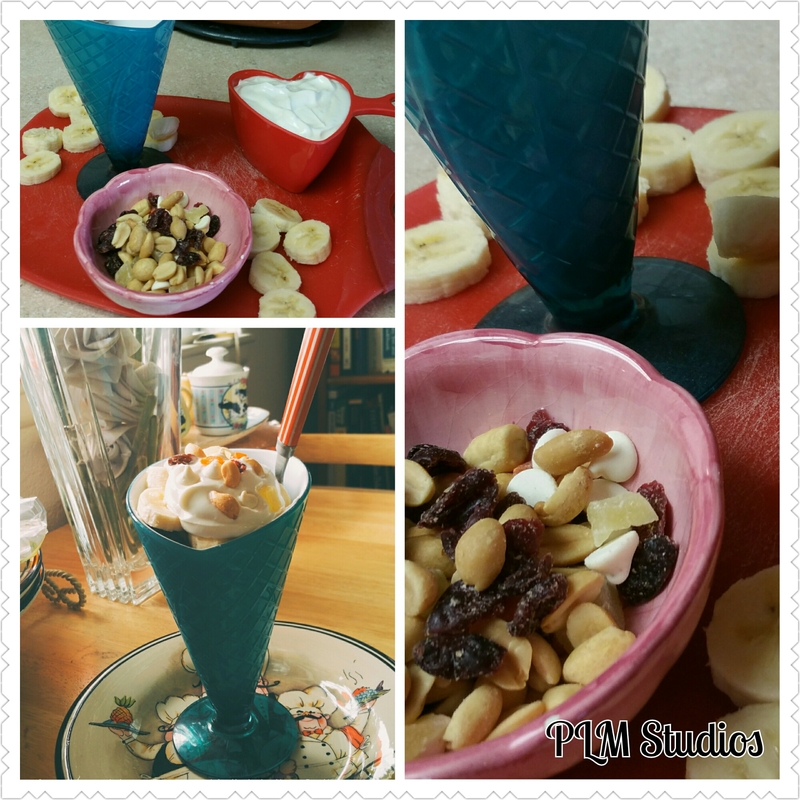 1 Cup combination trail mix with fruit and that’s any flavor any kind you like. 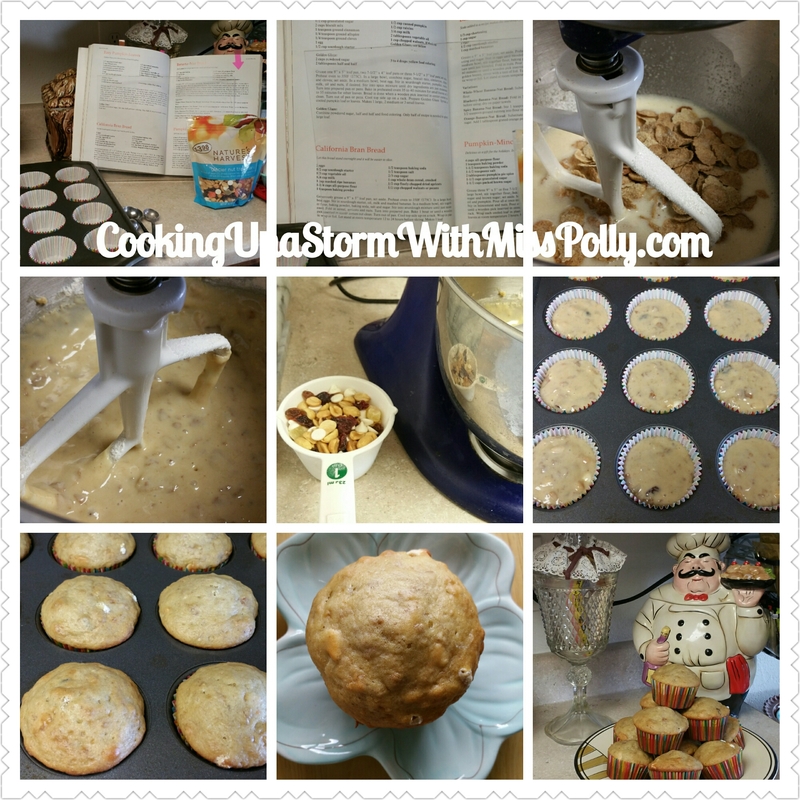 I used one that had mangos, pineapple, peanuts, raisins, and dried cranberries and a little white chocolate chips. 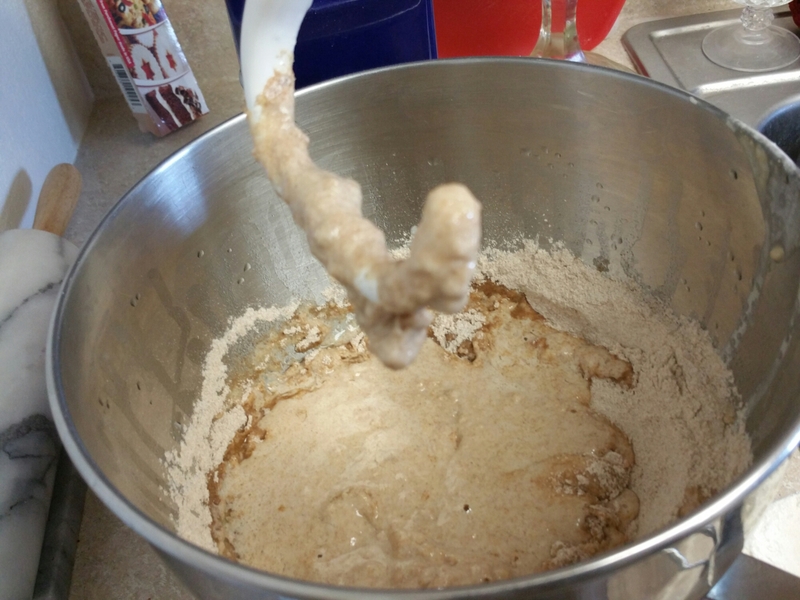 Simply mix all ingredients in your Kitchen Aid mixer with a paddle and mix the liquid ingredients first, adding in the flour and leavening agents and sugar. All I did was break up the banana into smaller bits and threw it in the Kitchen Aid mixer and the KitchenAid mixer will mix it for you. There’s no need to mash it before you put it in it’ll do the mashing for you. 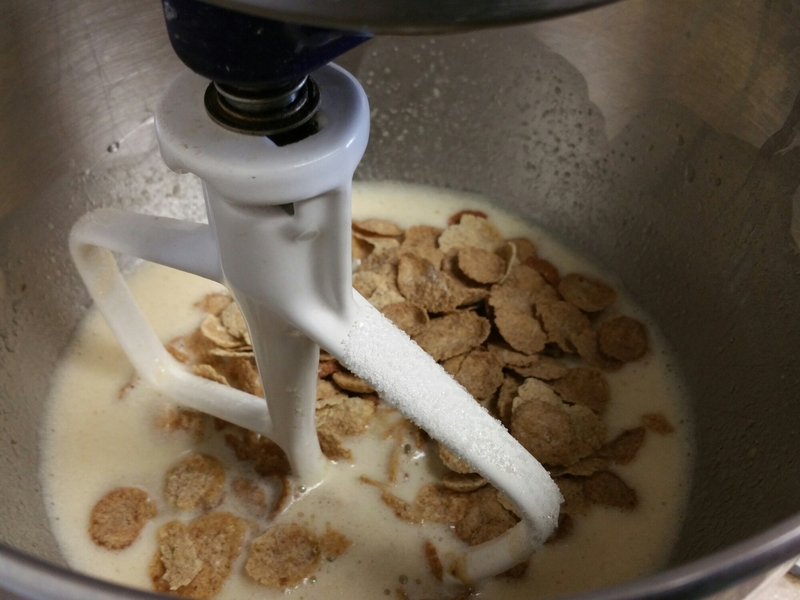 The bran flakes WILL BE THOROUGHLY MIXED FOR YOU because when THE KITCHEN AID MIXER IS on lock setting it’s like a food processor & will smash up whatever is in there…. within reason. Terrible way to put it but that’s the truth! Anytime there’s a way to do something easier and faster I’ll find it! I asked all my friends on Facebook if somebody could come up with a name and he didn’t about 10 minutes. The recipe and how to is coming very soon guys. Be patient and stay tuned. 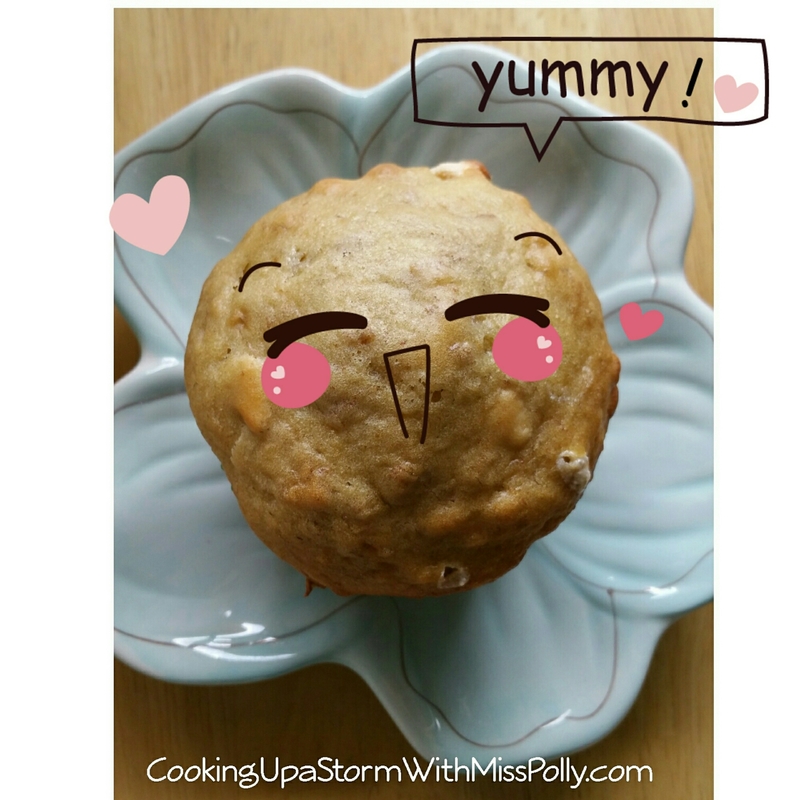 Set your oven to 350 degrees and bake for about 20 minutes or twenty five minutes, until the muffins test done with a toothpick. 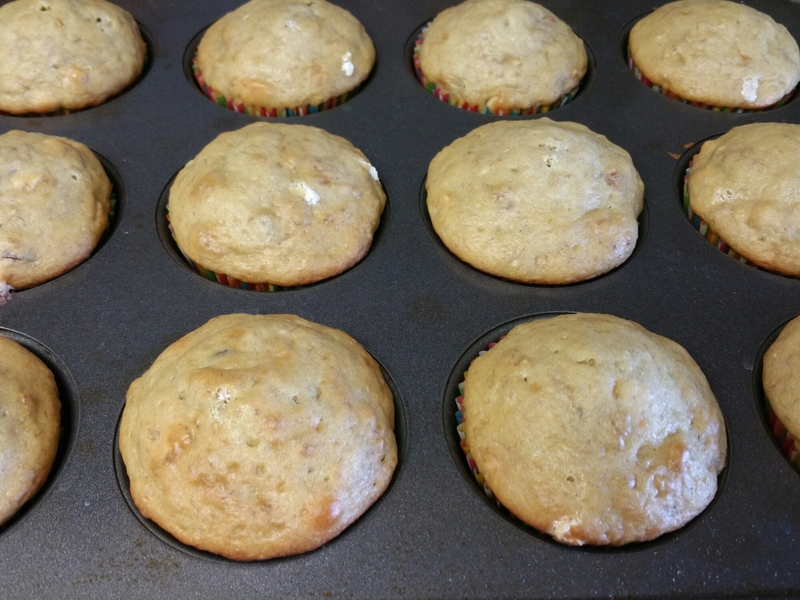 To make it easy to put the batter in the cupcake liners, all I did was take a stainless steel ice cream scoop and then scooped it easily in each cupcake liner with no drips. 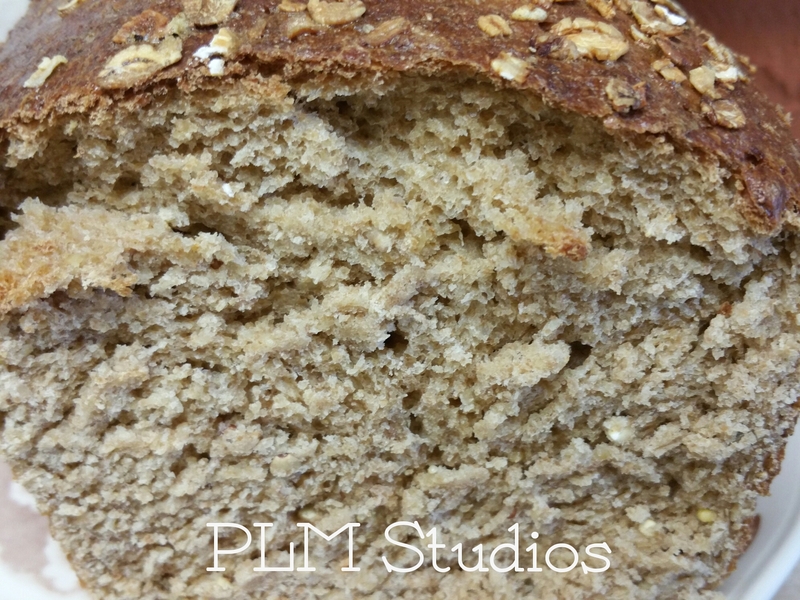 This recipe began from one called California Bran Bread from Rita Davenport’s Sourdough Cookbook. 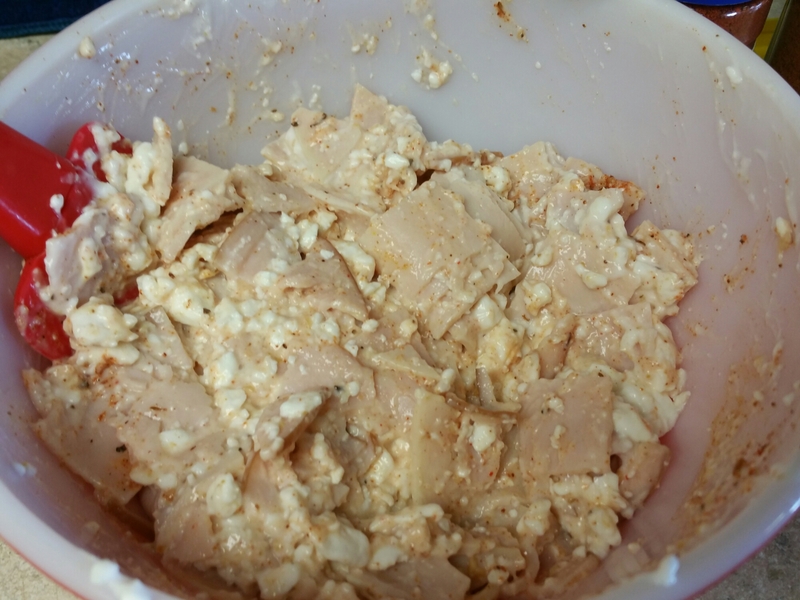 Mix the cottage cheese, Greek Yogurt, Parmesan, peppers and tomatoes in a large food processor and blend until the cottage cheese is smooth and the vegetables are chopped in small bits. 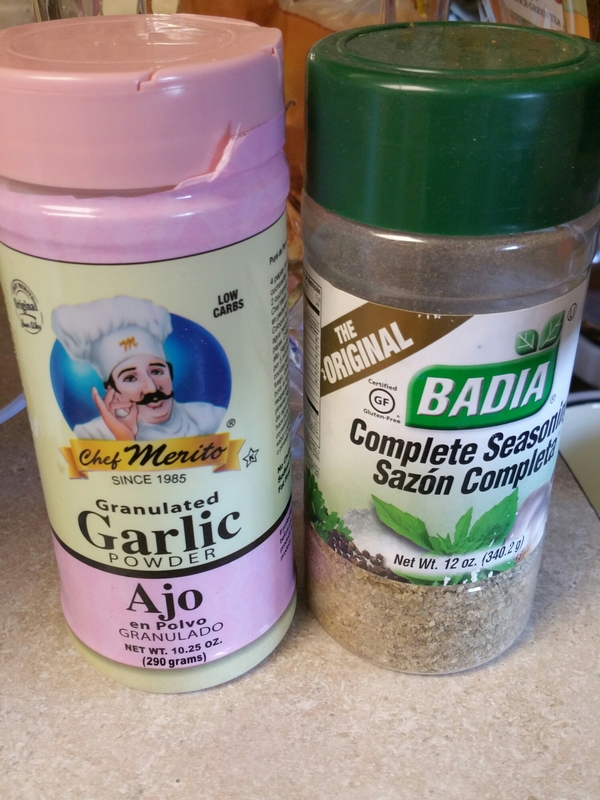 You can also add garlic or Italian seasoning to fit your own taste. Top cooked pasta with garlic veggie cream sauce. 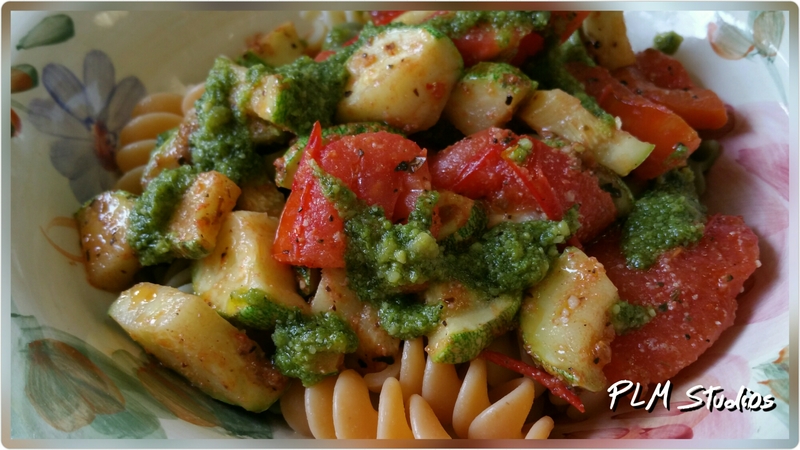 You’ll be happy to know that this pasta dishes really good for you and very low in fat too. 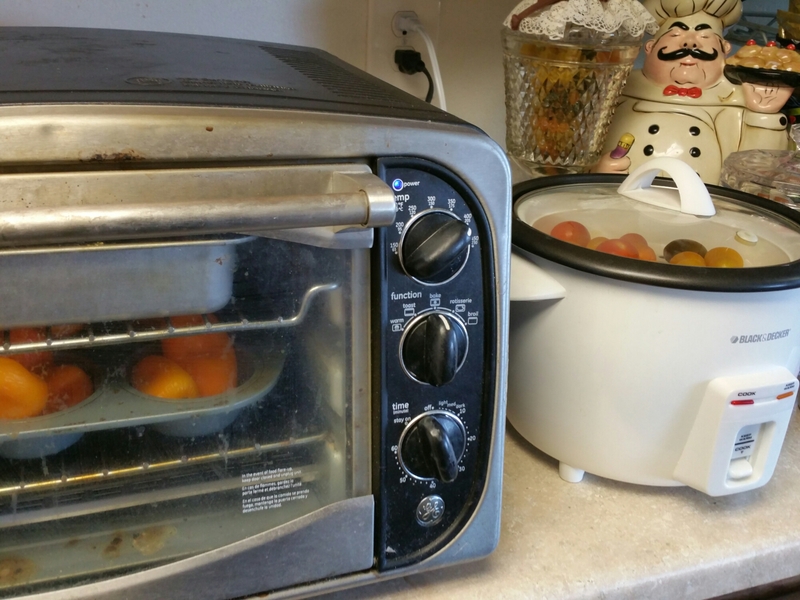 This recipe uses two really wonderful and convenient appliances that team up side by side-the rice cooker and a convection oven. 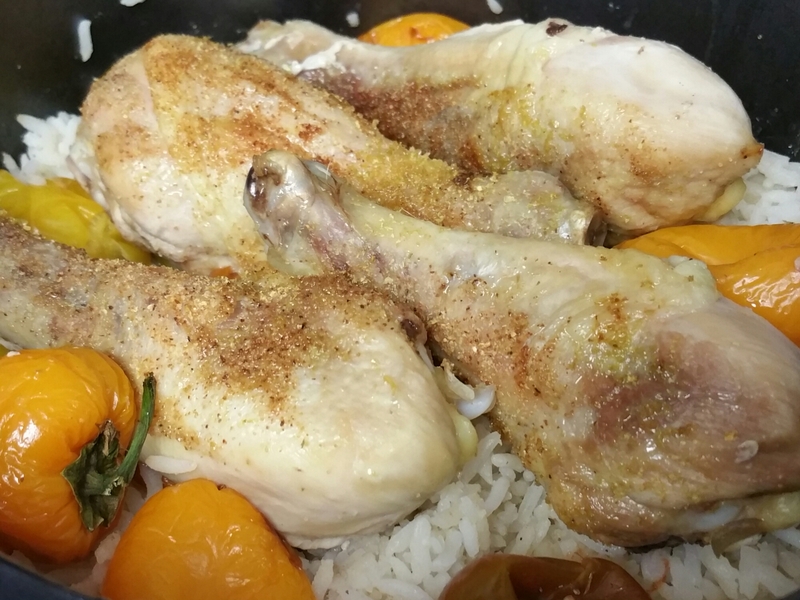 You can whip this up in less than hour and when presented it makes a beautiful chicken and rice dish….with leftovers, if you have fewer than 6 people. 6 chicken drumsticks. Skin left on to bake because it seals the juices in the bird. You can take the skin off after baking! 2 cupful *provided with your brand of Rice Cooker. The steamed heirloom baby tomatoes will be sweet like they had sugar on them, but they don’t. The sweet peppers will also taste sweet and you can pull the stems off once you taste their sweetness in your happy mouth! 1. 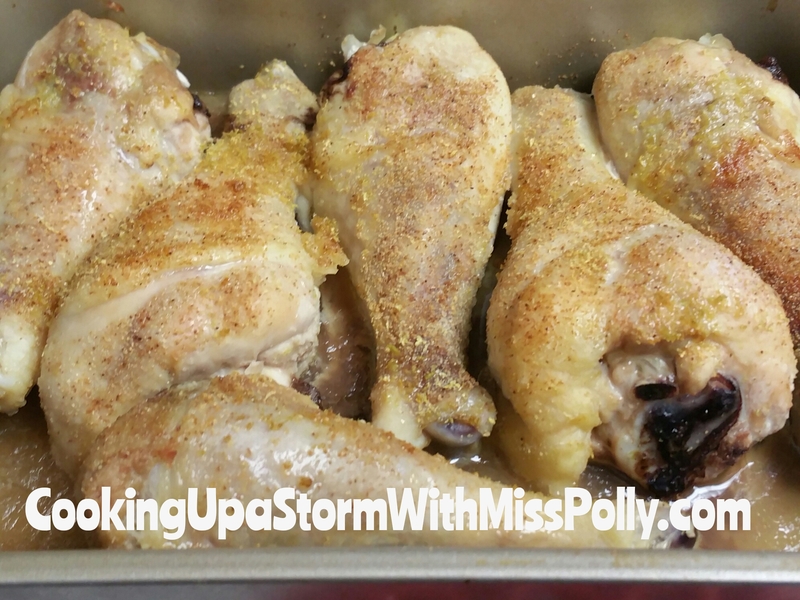 Simply sprinkle the lemon peel on chicken drumsticks, and sprinkle lightly with some garlic powder. Place in a small baking pan been sprayed with nonstick spray. 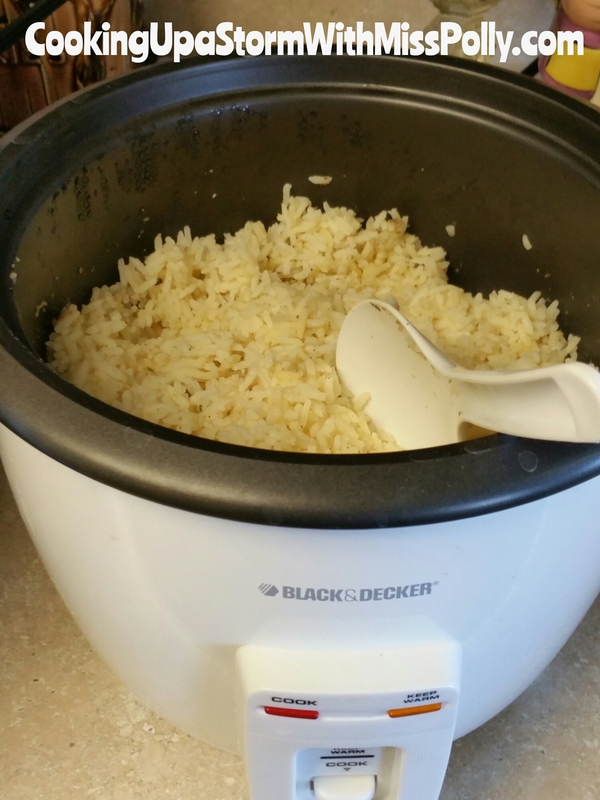 Put the rice in the rice cooker and cook for 30 minutes or until the rice cooker tells you that the rice is done. 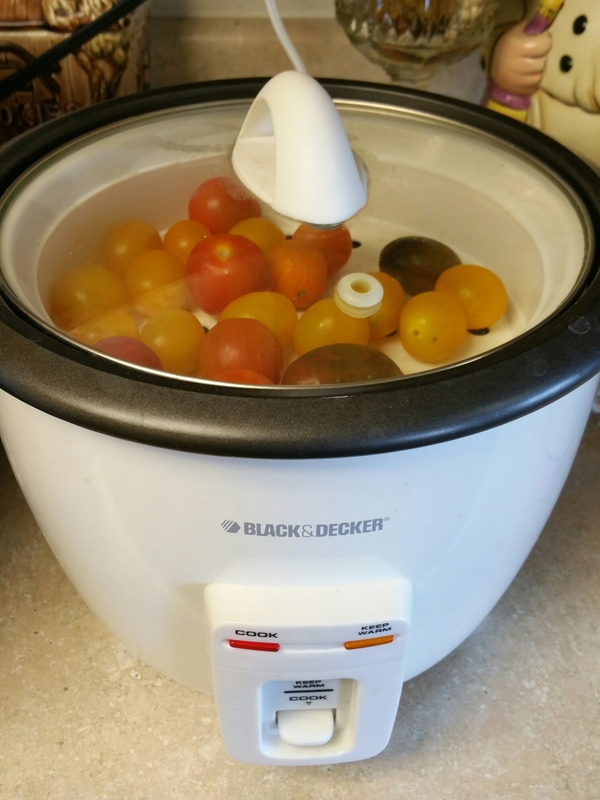 My rice cooker has a steam tray built into it and I put the tomatoes on there and they’re steaming wild rice is cooking, which I love. 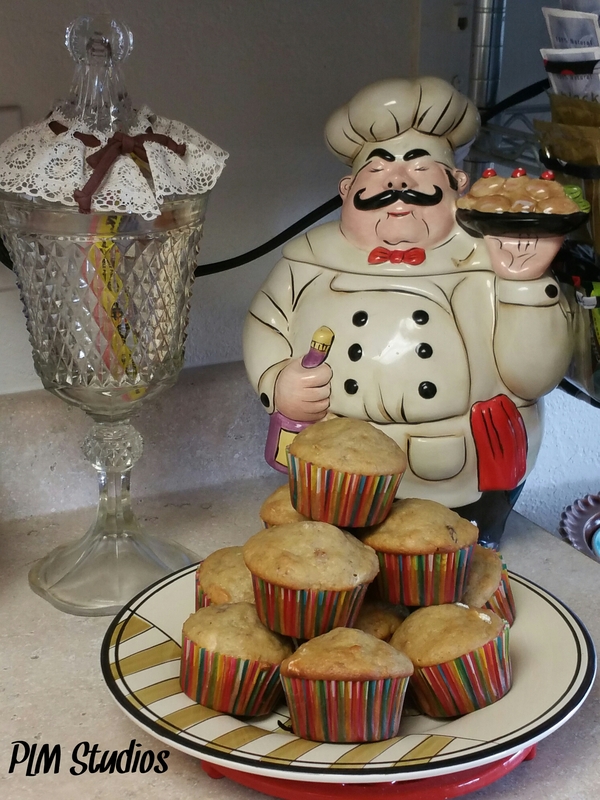 Put both the chicken and put the miniature peppers in a greased muffin pan with their fattest side up. 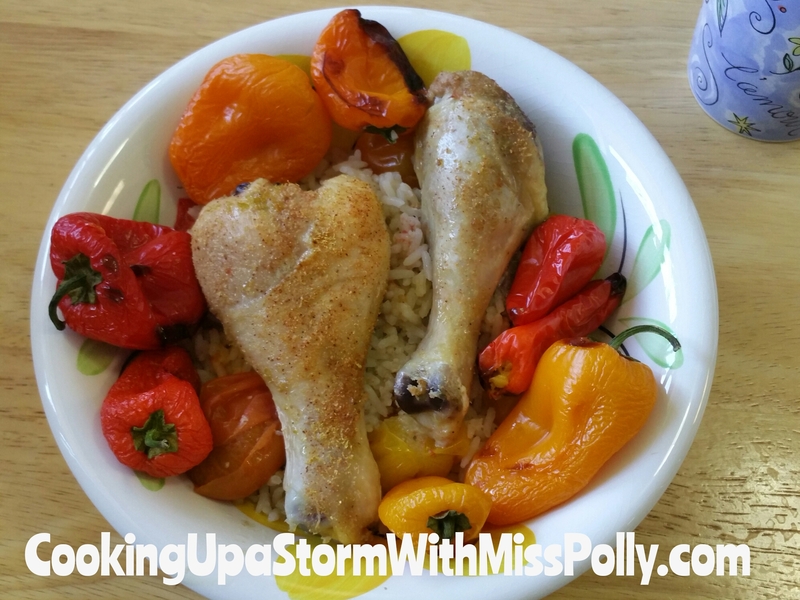 Set the rice cooker at the same time the chicken and peppers roast at 400 degrees for 30 minutes and they should get done about the same time. 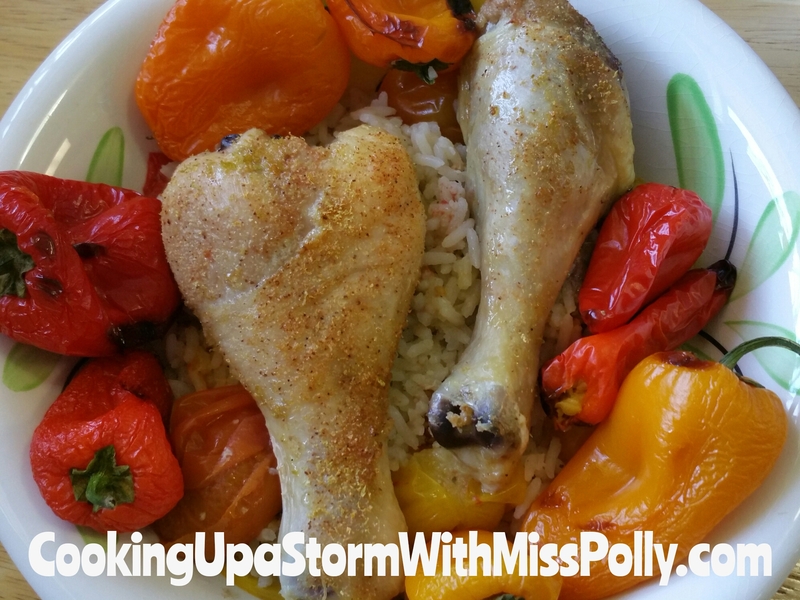 Bake the chicken & miniature peppers together, one on top the other. 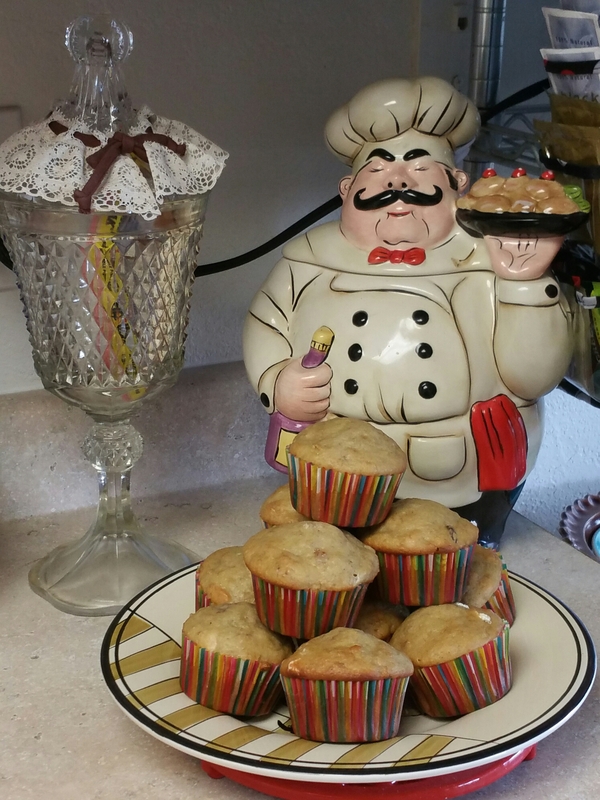 I put the peppers in a muffin pan to fit that fit my convection oven, I got at Bed Bath & Beyond. 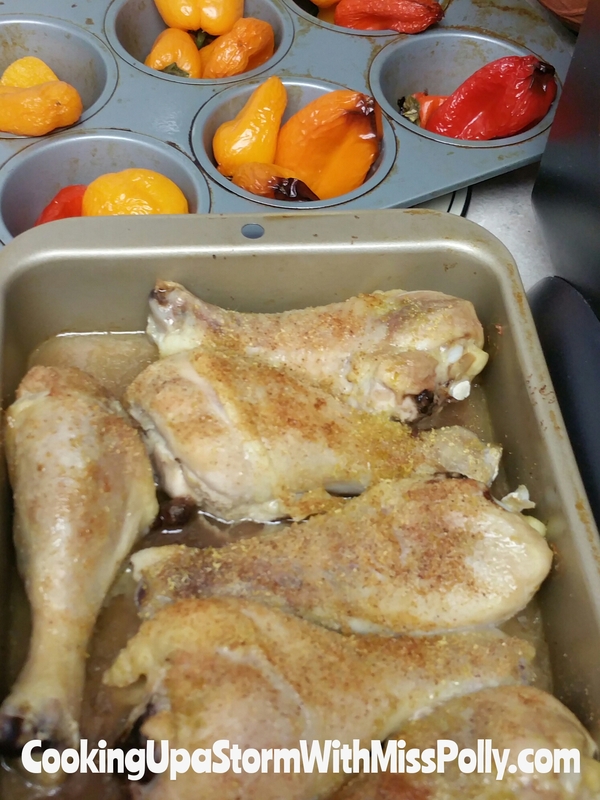 Roast the chicken and peppers at 425 degrees for 30 minutes initially. See how they’re doing it 30 minutes and put on for an additional 15 minutes if necessary, until the chicken looks done and not pink inside. Once the sweet peppers are cooked to your liking and browned, take them out of the oven. When the chicken he’s just about done sprinkle some extra virgin olive oil on it and return it back to the oven. Then you’ll have happy leftovers that you’ll actually look forward to eating! 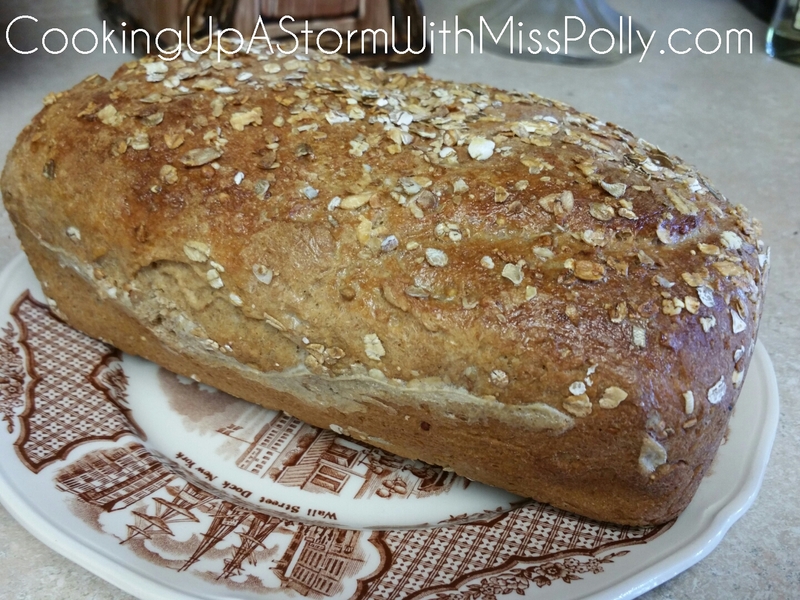 One egg white mixed with 2 tablespoons water to coat the top of the bread before baking and about 3 tablespoons rolled oats to put on inside the grease loaf pans get on top of the loaves before baking. Mixed the 1 1/4 cups boiling water, 1 Cup rolled oats 2/3 cup brown sugar, one third cup canola oil, 2 teaspoon salt and cool slightly. 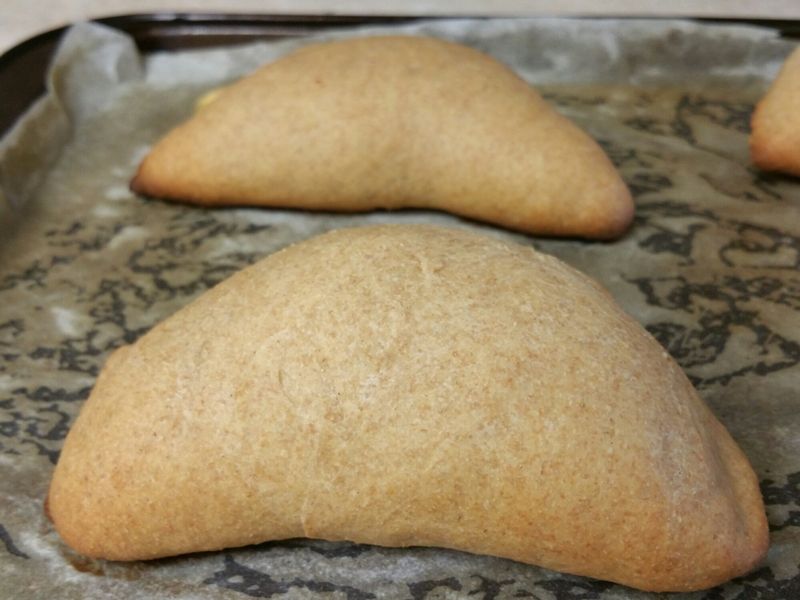 While still warm, add 2 tablespoons of active dry yeast, and then add in one half cup warm water heated to a hundred and five degrees. Add in 1 cup sourdough starter, 1/4 cup egg substitute, 3 cups whole wheat flour, 2 cups all purpose unbleached flour, I need in your Kitchen Aid mixer with the dough hook for 10 minutes. 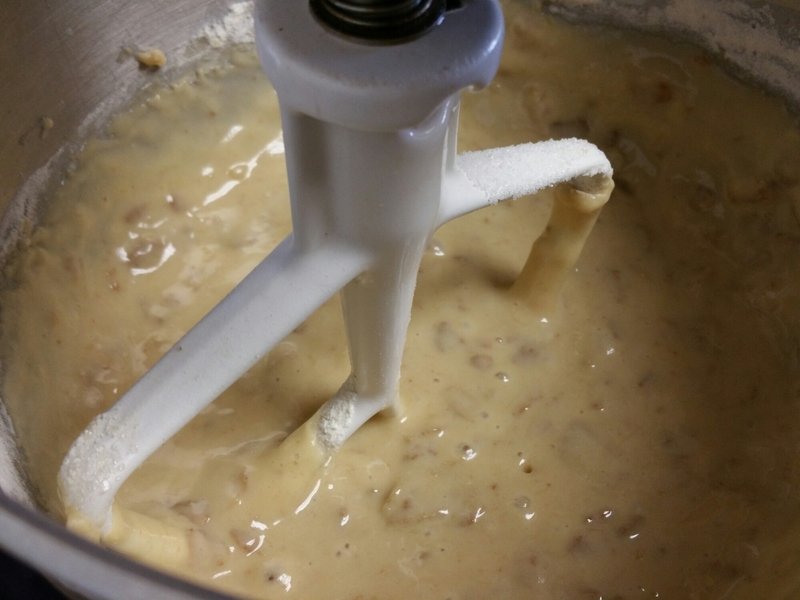 You will want to stay by the mixer and occasionally scrape the sides of the bowl, turning off the mixer, making sure that the dough is mix properly. 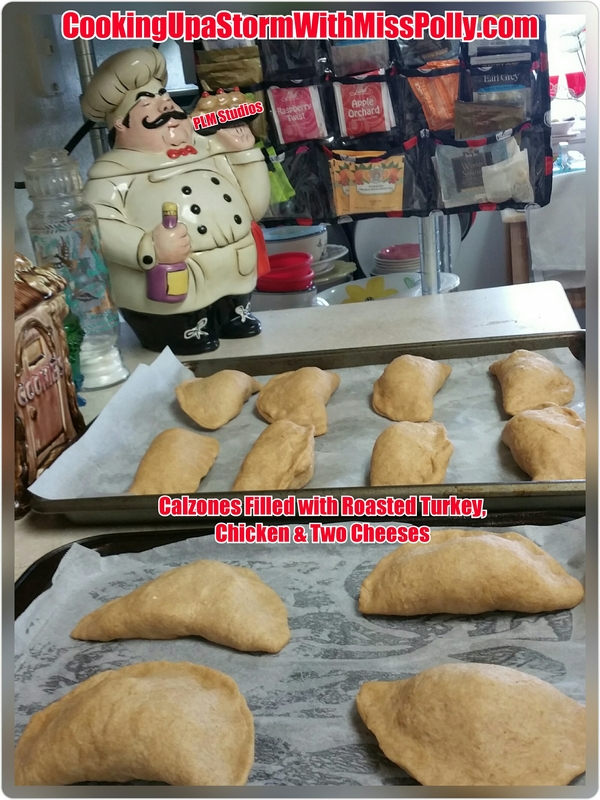 You can turn on the oven to 375 degrees and let it preheat while the dough is mixing and kneading. 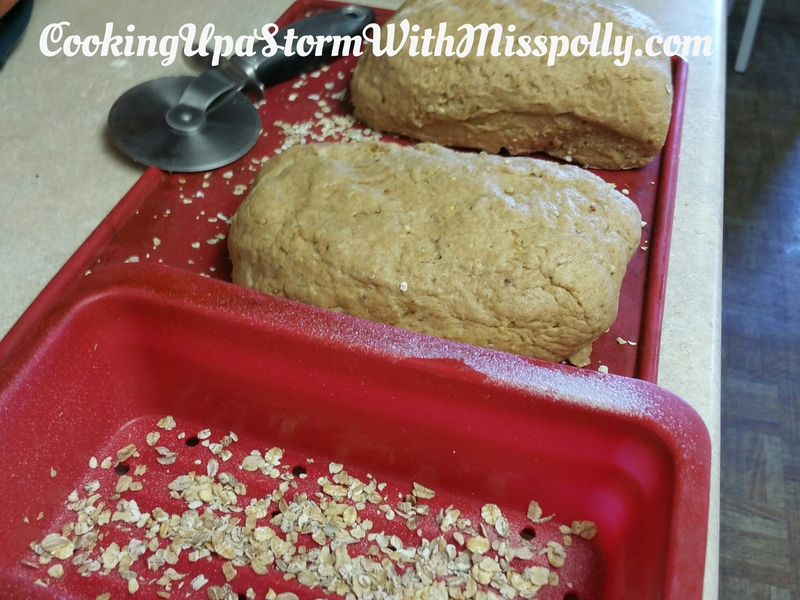 After 10 minutes is up, grease 2 loaf pans and sprinkle rolled oats in the pans. 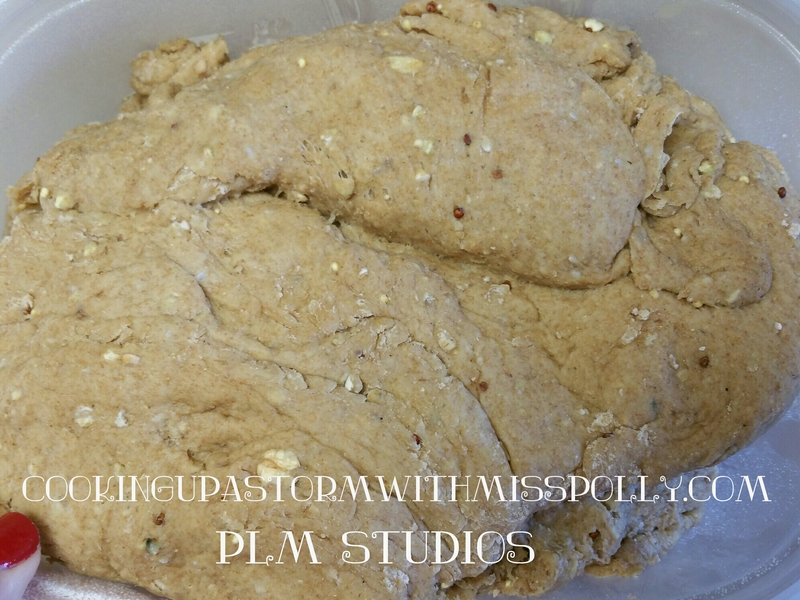 Let the dough rise in a greased container until it’s doubled in size, about 1 hour. Plop out the dough onto your baking area that has a few tablespoons of instant oatmeal sprinkled on it. 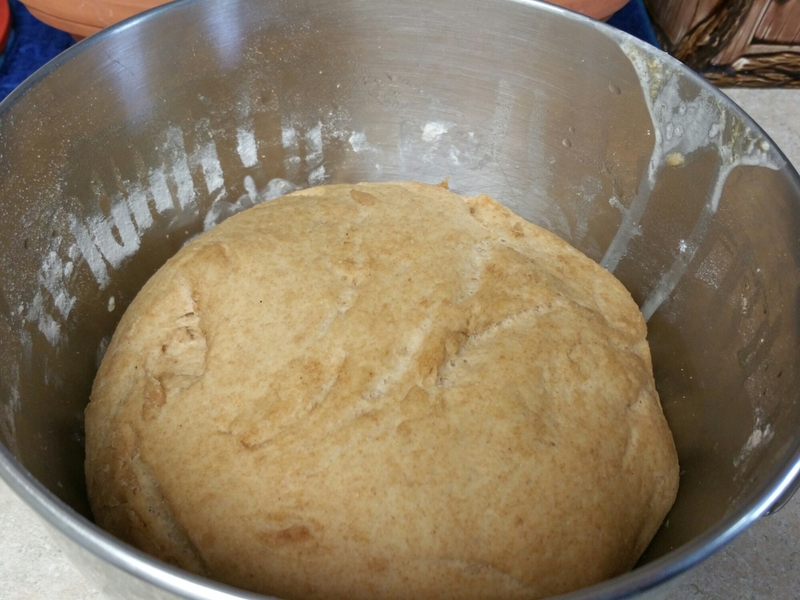 Knead slightly with your hands and make sure all the flour is incorporated into the dough. Press out the door on a pastry board or cleaning service that’s been sprinkled with rolled oats and press the dough into it. You want to make a rectangle out of the dough as pictured. 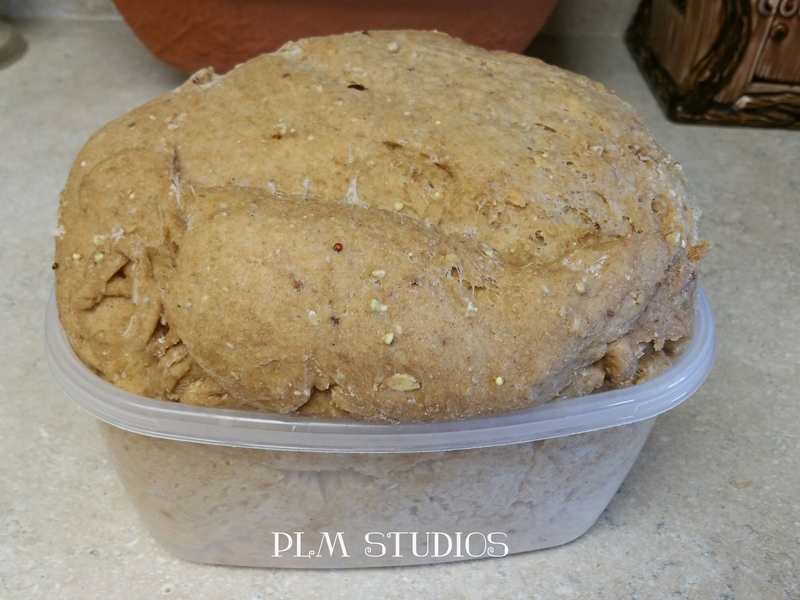 Cut the dough into two parts with a sharp pizza cutter, and form into 2 loaves. 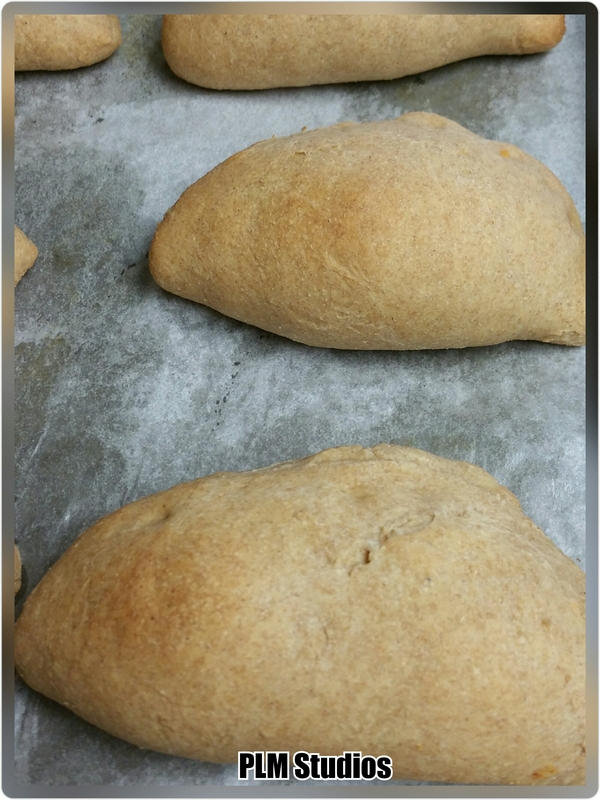 After shaping into loaves, let rise again for about 45 minutes, or until the loaves are doubled in size. Once the loaves have risen for the second time, brush the tops of the loaves with 1 egg white mixed with 1 tablespoon water. 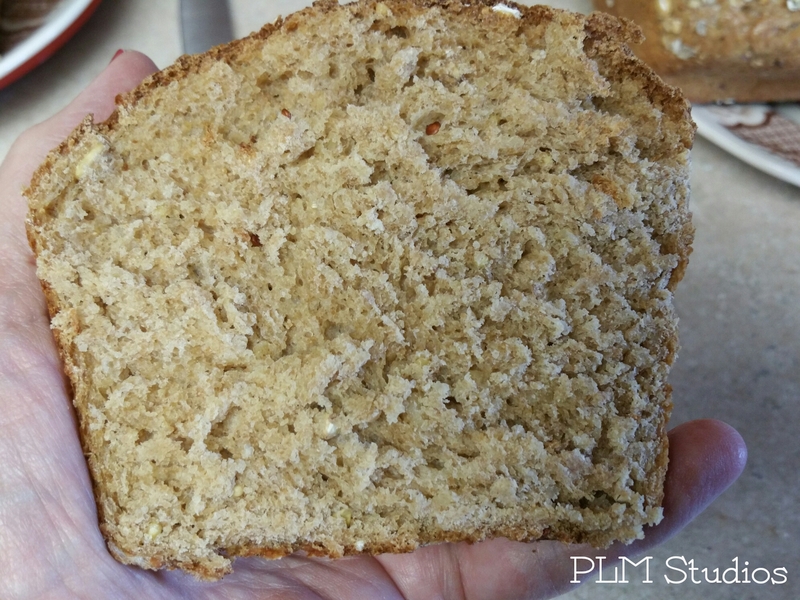 Take a few more tablespoons of the instant oatmeal and sprinkle on the top and press into the loaves. 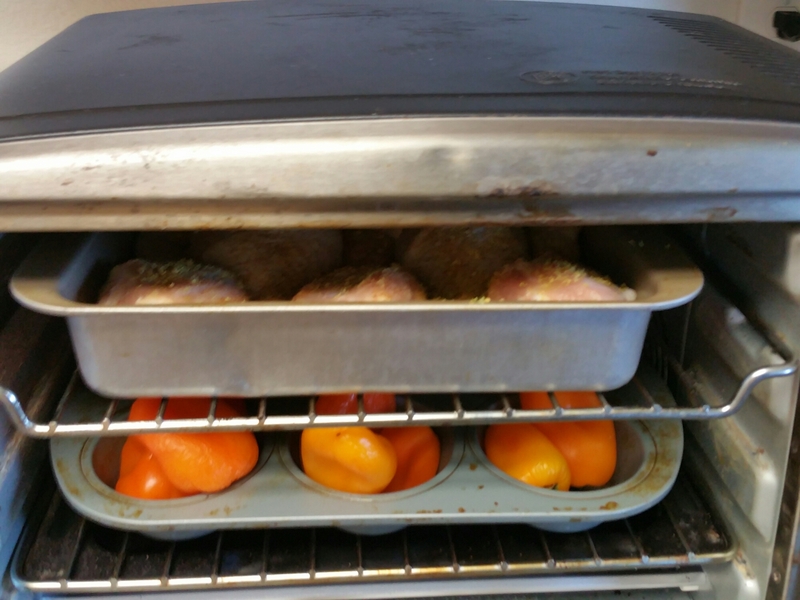 Making a 375-degree oven for 40 to 50 minutes, checking it 40 minutes. If after 30 minutes they’re starting to Brown, cover with a tent of oil to prevent for the browning. What cool in pans slightly, loosening the edges of the loaf pans with a butter knife. Turn out of the pans and cool on a rack. 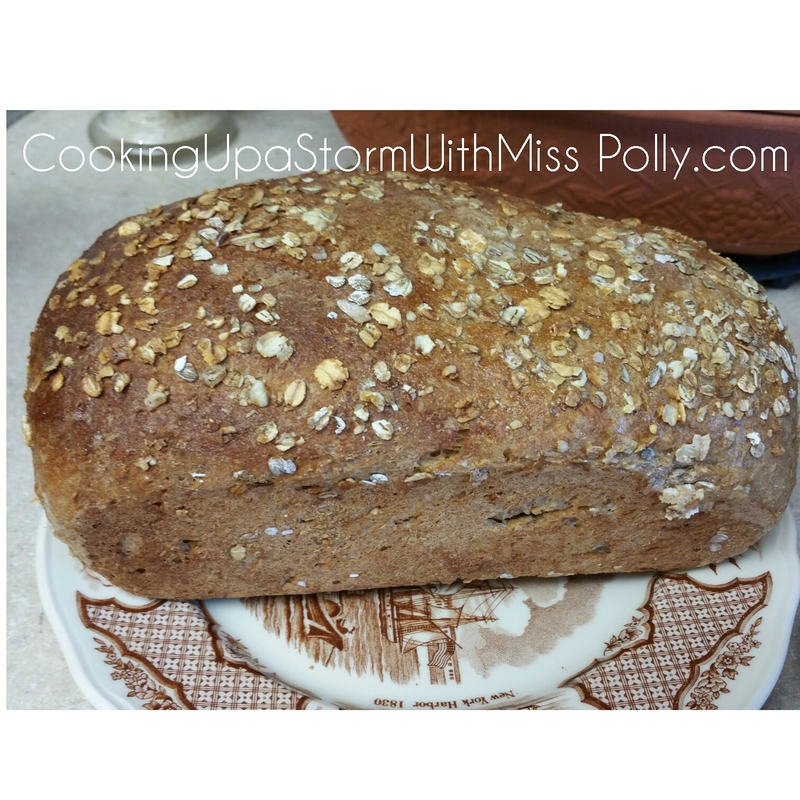 This recipe makes two wonderful big brown multi-grain loaves of bread. April 20th, 2016 1:02 p.m. These were greatly adapted by Paulette Motzko from the recipe “Ham Crescent Rolls” from Rita Davenport’s The Sourdough Cook Book. 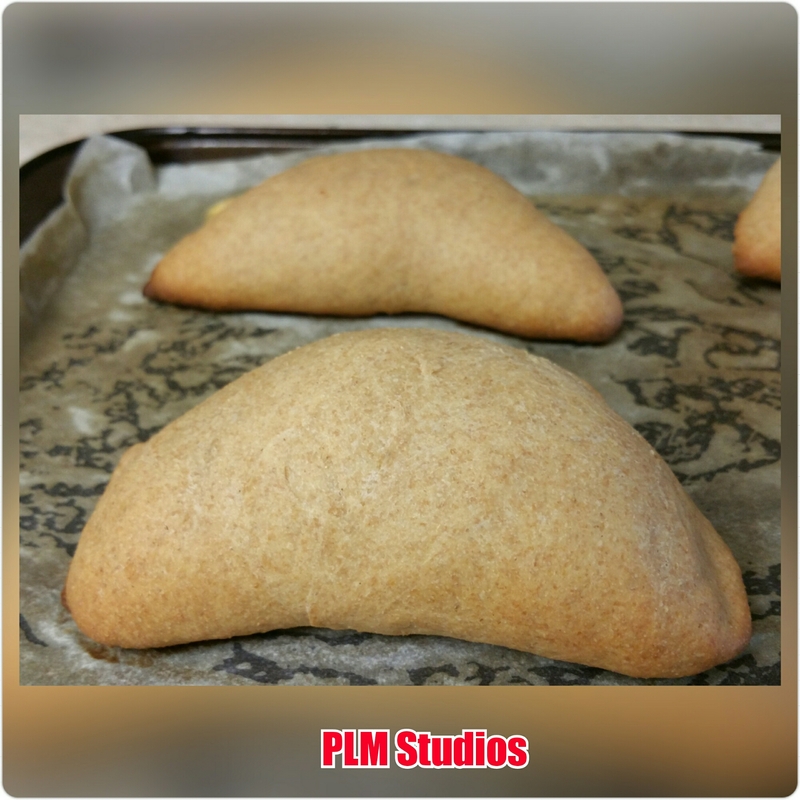 After 1 hour the Light Wheat Dough is ready to shape into sandwich pockets or Calzones. Whatever you call them they’re the same thing. 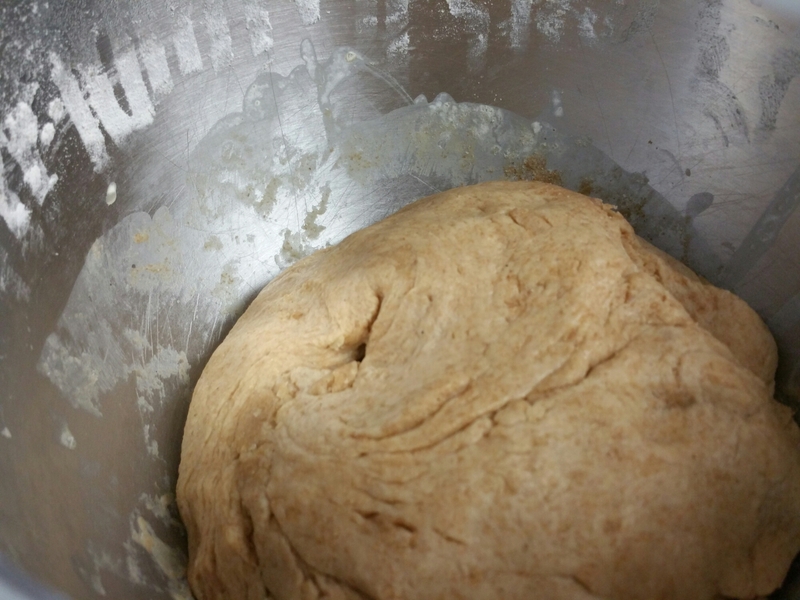 The light whole wheat dough is rising now…. 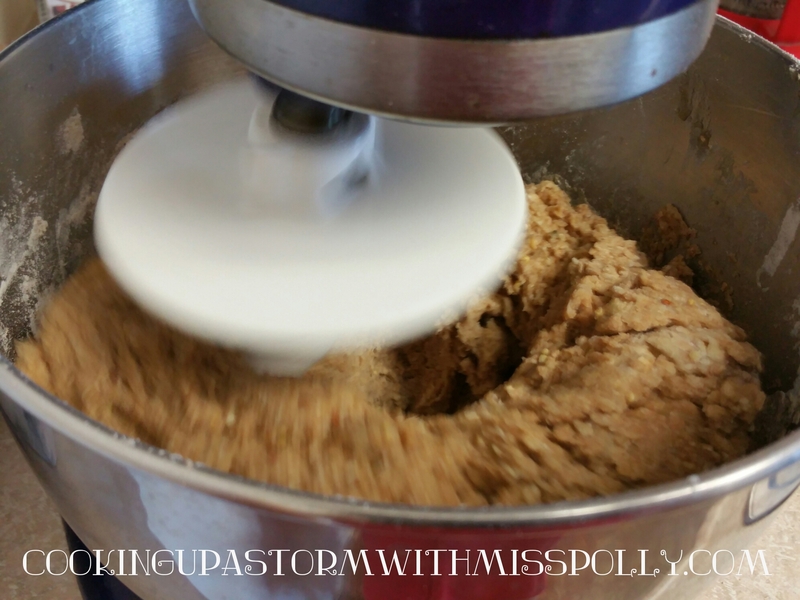 Shape the dough into a dozen balls after mixing in a KitchenAid mixer or by hand for about 8 minutes. And flatten each ball out large enough that you can fold it over with filling. Each circle should be about the size of your hand. 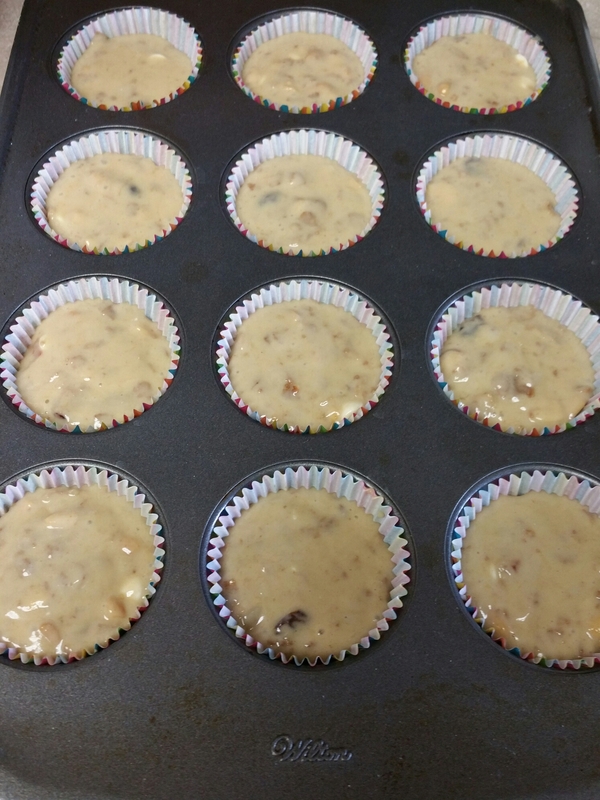 Take a couple spoons of the filling and put it close to the center of the dough ball and then very carefully turn it to the side and push it all the way around and then put it on a parchment paper lined baking sheet that have non-stick spray sprayed on it first. 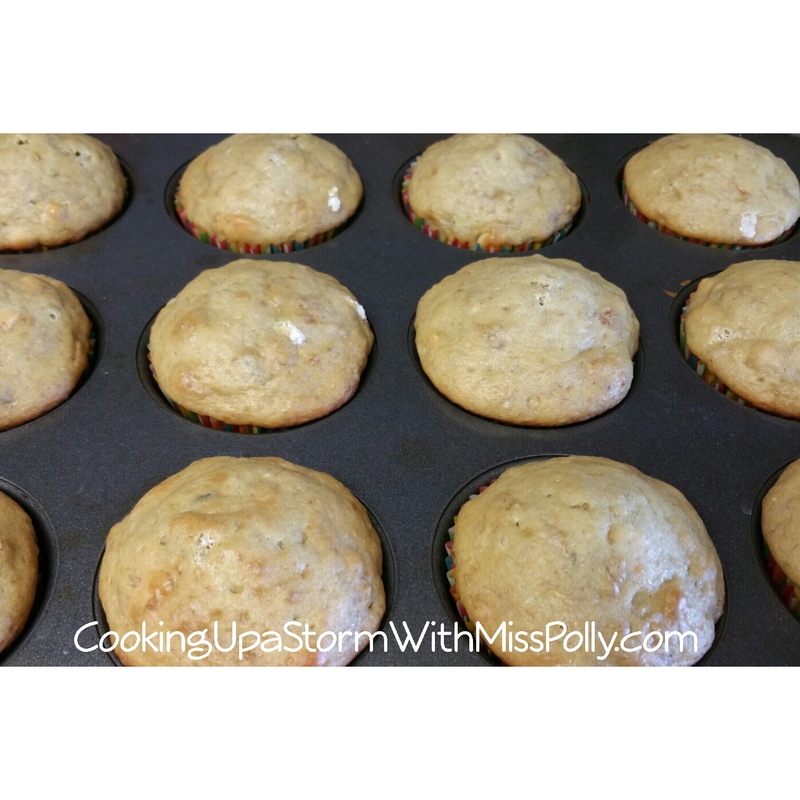 The non-stick spray helps hold down the parchment paper. Bake at 375 degrees for about 12 to 15 minutes until golden brown. You can serve these with sources depending on what you put inside him. 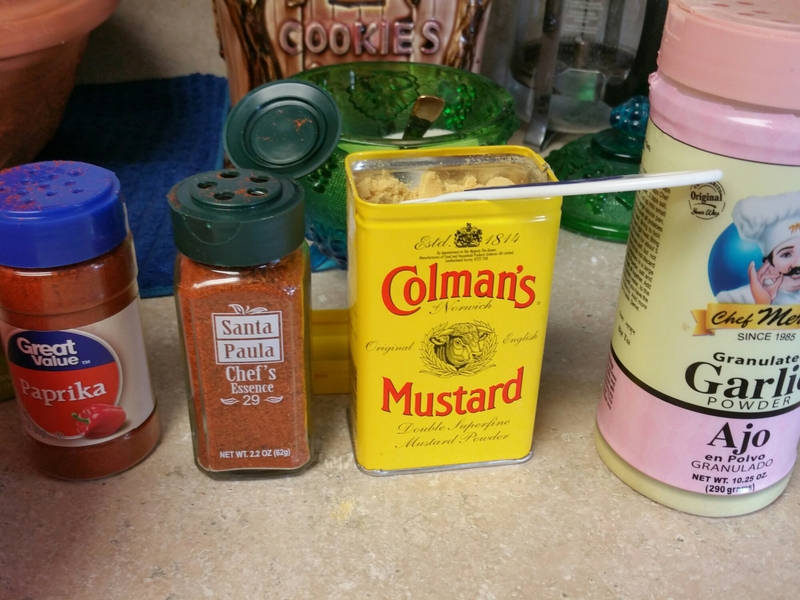 If you put like a smoked pork feeling you could serve them with BBQ sauce with these you could put the cheese sauce or just have them plain. 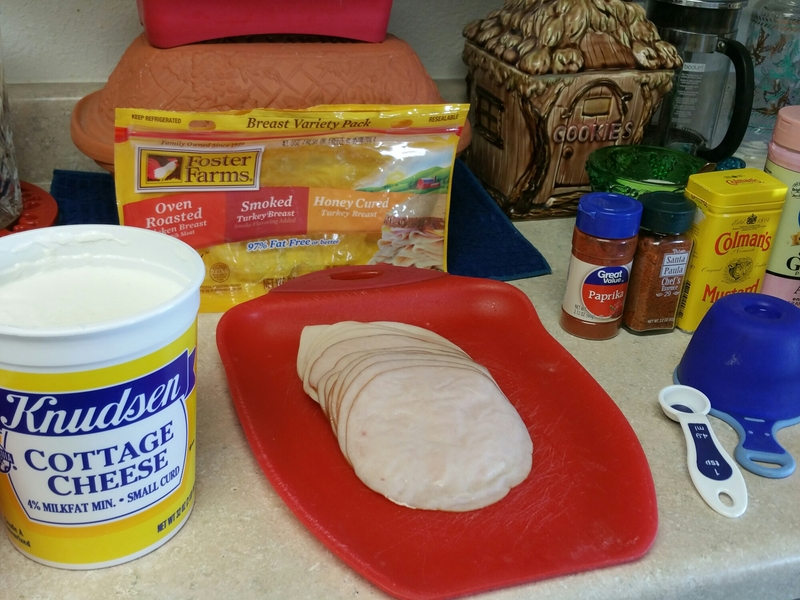 The sandwich pockets are a great way to use up leftovers in your fridge period little pieces of meat, chicken, pork or turkey and veggies like onion celery chopped finely add a nice crunch to it as well .